When a friend suggested that my house may be a Sears kit home I went searching for the styles offered in 1915. Nothing I’ve found indicates that my house is one of these, but I rediscovered the simplicity of affordable housing while paging through what I did find. Most would agree that our lifestyles have changed dramatically since 1915, but certain design principles seem just as relevant today as they were then. Certain design concepts may even find a renewed place in our post-oil economy. First and foremost is the front porch. Indeed a response to the unavailability of air conditioning, the front porch was certainly part of a family’s entertainment. When there wasn’t an affordable way to cross the city or country to see friends and family, the front porch was the place to socialize. It was a place to connect with neighbors as well as a place to escape the summer’s heat. Another notable feature of many of these homes was the sleeping porch. 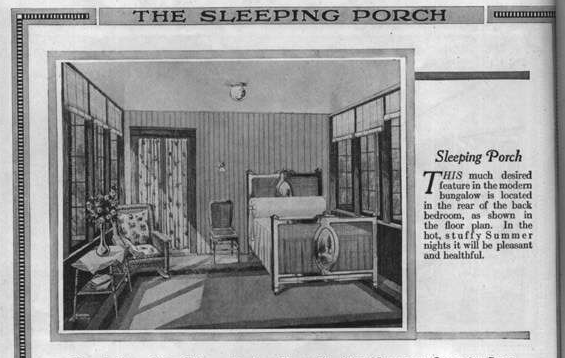 Again in response to comfort, the sleeping porch was a place to escape hot summer nights. Usually on the second floor, the screened-in area provided comfort, and depending upon how it was furnished, could easily sleep a family of three or four. Both of these features become logical again as we move towards decreased dependancy on cheap energy. Most of the homes had small closets and I think its valuable to consider this. Was there less of a need to store clothing then than there is today? Unlikely. Perhaps what was different was that need surpassed the idea of want. Consider too, that shopping was local, cash payment was the only option and consumers carried home what they bought. Could there be a correlation between closet size and record-setting consumer debt? Simple square homes and simple roof lines meant greater affordability. Small homes for small city lots meant shorter trips, on foot, to the market and the kitchen was a place to prepare meals made from local ingredients purchased daily. Large quantities were not shipped in and could not be refrigerated for long periods. Our expectations of daily life have grown to such proportions that we’ve created much of the dilemma with which we now find ourselves wrangling. Our economy is not threatened by what can’t be produced. It becomes threatened only by outlandish expectations and perhaps the answers to our current challenges are contained on the brittle pages of old Sears catalogs. OSU’s Department of Design will host the Senior Exhibition at the newly opened OSU Urban Arts Space, located in the former Lazarus building – downtown Columbus. Over 50 thesis projects from graduating students will be on display Tuesday June 3rd – Friday June 13th. The show attracts corporate attention from around the US as industry leaders come seeking the best and brightest talent in the areas of industrial, interior and communication design. The opening reception takes place Wednesday June 4th, 5-8pm. The event is open to the public and there is no cost for admission. This year marks the 40th anniversary of the Ohio State University’s Department of Design. Living near enough to it to have a slight interest, I’ve casually followed the news on the 70/71 split. I don’t use that portion of the freeways much at all, so I’ve been more interested in aesthetics than the usability. The only portion of reconstruction that will affect me is problem of getting around the added traffic that will be redirected onto nearby surface streets. I’m now of the belief that the 70/71 spit redesign/reconstruction should end. One billion dollars could be better spent to build a more comprehensive public transportation system for the region. One billion dollars is simply too much to invest in aiding the use of the private automobile. London now requires drivers to pay a ₤5 per day fee to drive within the most congested areas of the city. Singapore and Paris have similar fees and both San Francisco and New York are considering similar plans. While caliber of Columbus is not nearly that of these cities, perhaps the congestion “tax” merely becomes a “pay per use” concept. Those unwilling to modify their commute by using a better public transportation system will pay the price by idling in near stand-still traffic. Eventually it will become cost-ineffective for commuters and that’s essentially what a congestion tax provides. One billion dollars could be also be used to redevelop acres of urban housing that would give more people more options to be closer to where they work. A few miles on public transit from a nearby vibrant neighborhood makes far better sense than a forty or fifty-mile daily commute. A short commute from an in-town neighborhood can be accomplished on a bicycle easily. A transportation budget that does not address the root cause of congestion is a pure waste of money and spending one billion dollars on a project that encourages greater ease of use for automobiles only exacerbates the problem. Ohio and Columbus should be smarter than that. It would have been impossible to imagine this twenty-three years ago when first moved to Salt Lake City. At the time most of the city was boarded up and the streets were void of pedestrians. Two downtown shopping malls, one across the street from the other, struggled for business. I lived downtown, two blocks from the abandoned Union Station in a rented condo. When I moved from the condo in 1997 it was on the market for $16,000. For nearly a decade the city struggled with the idea of light-rail. Meeting after meeting, public outcry against the project claimed that people in the “west” would never give up their cars. Nay-sayers didn’t want to fund transportation for the “poor”. Having won the 2002 Winter Olympic bid, UTA (Utah Transit Authority) sought FTA (Federal Transit Administration) funds to build the first light-rail line – a 15 mile line that stretched from downtown Salt Lake to the southern suburb of Sandy. By the end of 1999, the two-year construction project was complete. Less than three years later, a second line was built that traveled between downtown and the University of Utah. The former Union Station became the downtown terminus, and by 2002, it was the center of a new downtown development known as the Gateway. With 105 shops, a new planetarium, apartments and condos, it anchored a new downtown but led to the further demise of the existing shopping malls just three blocks away. It was decided to raze what was left of the two shopping malls, as well as a 12-story office tower and recreate a 20 acre mixed-use development spanning three city blocks. The central feature of the new downtown center named City Creek Center, is in fact, a re-exposed City Creek which for decades had been routed under the city. The project will be complete by 2012 and will comprise retail, office and residential space anchored by Nordstrom, Macy’s and as a grocery store. The light-rail lines which were said to be a waste of money now carry over 43,000 passengers weekly. To further reduce congestion, a heavy-rail line line running 38 miles through the northern suburbs and connecting Ogden opened this year. The 600 square foot condo I rented, equidistant to both of these projects and two blocks from the rail line is now valued at $91,400. Here’s some refreshing news from the Columbus Dispatch. A 2006 study by Ohio State University planning students found half-empty lots outside most developments, including some Polaris-area stores at noon on the day after Thanksgiving. The proposal would lower the number of required parking spaces for all commercial developments by 25 percent. From the May 12th “Commentary” section of the Christian Science Monitor. Sweden, of course, has done more than simply tax fossil fuel. It’s created bicycle lanes, encouraged “green” cars and buses, favored heat pumps over oil furnaces, put a toll on driving in Stockholm, and invested in renewable energies and recycling of waste heat, among other steps. The government now taxes vehicles based on carbon dioxide emissions rather than weight, helping Sweden become the leader in Europe in reducing carbon emissions from new cars.